China's two largest train makers, CSR and CNR, posted disappointing financial results Saturday, after July's deadly train collision inspired the country to put the brakes on rapid development of its railways. Workers assemble trains at China South Locomotive & Rolling Stock Corp Ltd's factory in Tianjin. The latest quarterly statements of CSR and CNR, posted on the Shanghai Stock Exchange website, showed that the two companies suffered much slower growth or even declines in net profits in the third quarter of 2011. The net profits of CSR Corp. Ltd., China's biggest train manufacturer, gained only 9.66 percent year-on-year to reach 772.61 million yuan (about 122.1 million U.S. dollars), compared with an increase of 85.08 percent, or 2.04 billion yuan, in the first half of this year. China CNR Corp. Ltd., the country's No. 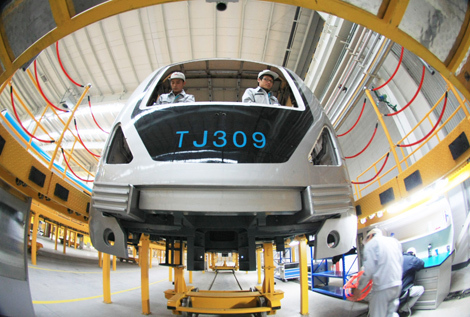 2 train maker, reported a 12.98 decline in net profits to 589.29 million yuan in the third quarter, compared with an upsurge of 145.03 percent, or 1.6 billion yuan in the first half of the year. The lackluster reports followed the Chinese government's steps to slash train services on high-speed rail links -- including the flagship Beijing-Shanghai line -- over safety concerns after a train accident near the eastern city of Wenzhou on July 23 killed 40 people and injured 210 others. CSR manufactured the trains involved in the accident. In its statement, CNR said it had completed the fixing of 54 bullet trains previously recalled on the Beijing-Shanghai high-speed line for safety reasons. "Delivery procedures are under way," CNR said, adding the recalls will have little impact on the company's operational results in 2011 other than extra testing and maintenance fees. The Chinese government's decision to slow the development of high-speed rail lines has led to halts in construction of about 90 percent of ongoing railway projects, or 10,000 km of rail lines across the country, the Beijing Times quoted Wang Mengshu, deputy chief engineer of the China Railway Tunnel Group, as saying on Saturday.